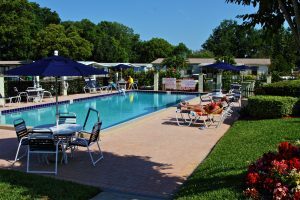 If you’re looking for a senior community that offers adventure when you want it along with quiet serenity to come home to, you’ll find it at Hyde Park near Orlando, Florida. Hyde Park is a gated community of high-quality manufactured homes that encourages an active lifestyle for adults 55 and older by providing an abundance of amenities and activities inside our gates. What’s more, the close proximity of our senior community to the Orlando, FL, area makes it even more appealing for those who enjoy visiting renowned theme parks, zoos, fine dining restaurants, specialty shopping centers, nature parks, and all the other attractions that have made this area an international tourist destination. In addition, a short drive will take you to an international airport and first-rate medical facilities. Our residents also enjoy the specialty shopping and planned events of picturesque downtown Winter Garden, all accessible by golf cart. You might think a senior community of this caliber is out of reach financially, but at Hyde Park, we’ve found a way to make this kind of active lifestyle affordable for many people, even on a retirement budget. We do it by providing comfortable living in low-maintenance manufactured homes, which typically cost less than site-built homes, surrounded by attractive common areas you’ll be proud to come home to. For more information about the Hyde Park senior community near bustling Orlando, FL, contact one of our Lifestyle Consultants today.